A stroller is a BASIC piece of equipment for any mom. How many years do you spend lugging that thing around? 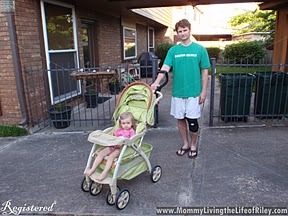 Personally, we still use the stroller portion of the travel system we received when Riley was born. It's so comfortable for her, we can mount a toy bar to the front, it has huge cup holders, a large storage area underneath, etc. There is one problem though with the large, roomy stroller. It's IMPOSSIBLE to maneuver successfully with just one hand! I don't know how many times I've been trying to carry something, push a door open or walk the dog WHILE pushing Riley in the stroller and it's definitely no fun! Also, I've noticed that although I am not that tall (only 5'8"), if I push Riley for an extended period of time in her stroller, my back and neck start to hurt because the handle is actually too short. This makes it so I have to hunch over the stroller somewhat, which is very uncomfortable. My husband, who is 6' tall, really has a hard time with it. If only there was something out there which could make a large stroller more maneuverable and more comfortable for taller people. Well parents, that's where the Easy Stroll comes in! The Easy Stroll Ergonomic Stroller Handle sells for $29.95 and even comes with FREE SHIPPING and a 30-day money back guarantee! Convenience... East Stroll provides total control of the stroller with just one hand. Your free hand can swing naturally as it would while walking without a stroller or can be used for other tasks, such as carrying a bag of groceries or holding hands with another child. A free hand is needed at some point virtually every time a stroller is used. Easy Stroll gives you this new freedom. 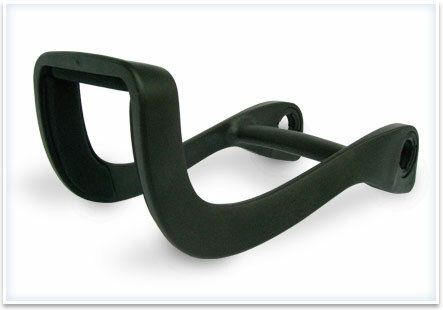 Easy Stroll works on most strollers that have standard handles with rubber or foam hand grips. Easy Stroll does not work with Umbrella type stroller handles or strollers with hard plastic hand grips. The first thing that you must realize before either purchasing or trying to install this product is that it does not work on umbrella strollers. Your stroller MUST have the standard rectangular-shaped handle (usually present on larger strollers and travel systems) for this to work. When I received this product, I noticed on the top of the directions that they claimed, "5-minute installation". Now, I didn't time my husband when he put it on, but it did seem very easy and it was installed quickly. When I asked him later, he agreed that the installation was a breeze and only took a few steps to complete. Next, it was time to take it for a spin. In the instruction booklet, you are cautioned not to steer the stroller with your arms any longer. The Easy Stroll works only when you control the movement of the stroller with your legs. This took a little getting used to, but in no time we were doing donuts in our driveway...with only ONE HAND! It was really easy to do and my other hand was free the entire time! Best of all, I was standing up STRAIGHT! Because the Easy Stroll rotates around the handle, it automatically finds the perfect height for your height. As we took Riley for a stroll around the block, the only thing I noticed was that the Easy Stroll was a little hard to steer successfully in tight spaces, such as our narrow neighborhood sidewalk. Maybe we just needed a little more practice, but we had some difficulty steering the stroller when we had to walk directly behind it, instead of off to the side a little. Because the Easy Stroll handle swivels on the stroller's handle, if you are in such a tight space and maneuvering with it becomes tough, simply let the Easy Stroll fall all the way down and use the stroller's regular handlebar instead. I can definitely see why the Easy Stroll is so popular and has won so many awards, including the iParenting Media and Mom's Best Awards. Strolling around with my daughter no longer has to result in a stiff back and neck. Also, having one arm completely free now allows me to drink a cup of coffee, talk on my cell phone, carry bulky shopping bags, etc. very easily! The installation was quick and simple and once you get used to steering with your feet, you'll be amazed at how maneuverable that bulky stroller can really be! Because it swivels on the stroller's handle, the Easy Stroll doesn't get in the way of packing up your stroller and you can use the stroller's original handle at any time. I sure wish I would have known about this product much earlier! Disclosure: I received the Easy Stroll Ergonomic Stroller Handle from Goosey-Loo Industries in order to facilitate my review. No other compensation was received. This product review is based on my own personal experiences with this item and is completely honest and objective.